The second post on The Myth of Jesus: The History Behind Faith which looks at some historical facts that dispelled some mythical and false beliefs I held regarding Jesus, his followers and the historical origins of Christianity. In this post I look at the consensus from historians (both Christian and skeptical) regarding three crucial points: (1) What the first followers of Jesus, such as Peter, claimed and believed. (2) Why Paul and James converted to Christianity. (3) The tomb where Jesus was buried was empty. How do we know what the followers of Jesus really believed and claimed? Historians both Christian and non-christian consider it a historical fact that the disciples of Jesus like Peter, Paul, and James the brother of Jesus, claimed and believed they had seen Jesus risen from the dead. The evidence for this historical fact is drawn from nine independent sources that fall into three categories: (1) Paul’s testimony about the disciples. (2) Oral tradition that was passed down through the church. (3) Written works of the early church[i]. One of the strongest evidence for the fact that the disciples claimed Jesus rose from the dead is oral tradition. Scholars are able to identify instances of oral traditions such as creeds, hymns, story summaries and poetry recorded in the New Testament. And since oral traditions had to first exist before they are recorded in the New Testament, they obviously predate it and provide access to the earliest teachings and beliefs of the first Christians. The reason why non-Christian and Christian historians and New Testament scholars agree that the creed goes back to origins of Christianity is because (1) Paul uses the Greek equivalent of technical rabbinical terms ‘delivered’ and ‘received’ which were traditionally terms used for oral traditions. (2) It contains several terms, sentence structure and diction dissimilar to Paul’s general writing indicating it is from another source. (3) The threefold usage of ‘and that’ similar to Aramaic and Hebrew Narration. The belief that Jesus was raised from the dead goes back to the earliest phase of Christianity demonstrating that it was a central belief from the beginning and it was not a legend that developed over time. The Gospels and Josephus the Jewish historian mention James as the brother of Jesus. He did not believe that Jesus was the Son of God while Jesus was alive and was a deeply devoted Jew. But something happened to him that converted him to Christianity. Historically we know that he became bishop of the church in Jerusalem. The ancient creed that Paul records states that James converted because Jesus appeared to him after his crucifixion. James became bishop in Jerusalem and was martyred for his belief in Jesus. James’s martyrdom is documented in history by ancient Jewish historian Josephus that James was illegally stoned to death in 60A.D. for his belief. Historians on the basis of the evidence consider it historically certain that the disciples of Jesus, Paul and James claimed and believed that they had seen Jesus risen after his death and were sincere in their beliefs being willing to die for them. Another piece of historical knowledge regarding Jesus that Christian and non Christians historians agree on, on the basis of evidence is that after his death and burial – his tomb was found to be empty. It has been said that the majority of contemporary researchers accept the historicity of this event [Jesus’ empty tomb]…From the study mentioned above, I have compiled 23 arguments for the empty tomb and 14 considerations against it, as cited by recent critical scholars…Of these scholars, approximately 75 per cent favor one or more of these arguments for the empty tomb, while approximately 25 per cent think that one or more arguments oppose it. Thus, while far from being unanimously held by critical scholars, it may surprise some that those who embrace the empty tomb as a historical fact still comprise a fairly strong majority”[vi]. Claims and beliefs about Jesus being risen from the dead originated in the same place where he was crucified and buried. The opponents of disciples such as the Romans and Jews only had to show that Jesus’ body was in the tomb to crush and end Christianity, however this never occurred. The belief that Jesus was raised from the dead could not have been possible without an empty tomb. If the body of Jesus was still in the tomb then it would be absurd to claim and believe that Jesus was raised from the dead. Women were the first to discover the empty tomb. Women in ancient times were considered very unreliable witnesses and their testimonies were held in low esteem with little credibility. 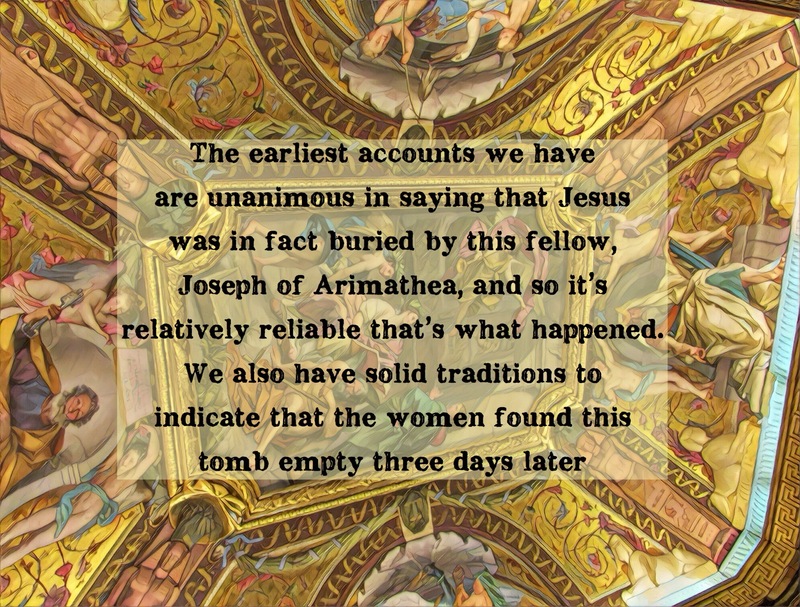 If the empty tomb was a legend then the New Testament writers would not have used women as the first and primary eye witnesses to its discovery. The early tradition captured by the creed recorded by Paul in 1Corinthians 15:3-7 indicates that Jesus was buried and then raised on the third day. The reference to Jesus being raised on the third day must refer to the day the tomb was discovered to be empty. If the tomb was not empty then why would the earliest Christian tradition state that Jesus was raised on the third day. Within the Jewish context, the concept of a resurrection always meant a bodily resurrection and not a metaphorical or spiritual one. It would have been a contradiction in terms for the disciples to believe that Jesus was raised from the dead without the tomb being empty of his body. My main point has been to share what historians of all stripes, Christian and non-Christian, agree are historical facts well supported by the historical evidence. Jesus was an actual historical figure who lived, was crucified by Pontius Pilate, and was buried in a tomb by Joseph of Aramethea. The disciples of Jesus such as Peter claimed and believed to have experienced appearances of Jesus after his death. The sincerity of their beliefs was demonstrated by their willingness to die for their beliefs. Paul and James converted to Christianity because they claimed and believed they had seen the risen Jesus appear to them and they also willingly died for their claims demonstrating their sincerity. The tomb where Jesus was buried by Joseph of Aramathea was found empty. Christianity originated because the disciples claimed and believed Jesus had risen from the dead. The theme for the posts has been an attempt to provide an answer to Common and others such as myself who asked themselves but why Jesus? We are in a position to say the following. We know about Jesus today because his disciples such as Peter, converts such as Paul and James his brother, believed that Jesus had done something and not taught something. They claimed and believed sincerely to the point of death, that Jesus after his death had risen from the dead and appeared to them. They interpreted this miraculous event as a vindication of Jesus’ identity. It meant Jesus was indeed who He claimed to be; the Son of God, one equal in nature with God and through him alone we could be united truly with God. Their mission thus began to tell people what they witnessed and that is why we are told, “Believe in Jesus because for me He did die”. The next logical question is: what is the best explanation for the historical facts and events behind the Christian faith? Was there really a resurrection? Perhaps the disciples hallucinated; perhaps they stole the body, or Jesus never died and they thought he did; or perhaps they went to the wrong tomb. In a forthcoming post I will evaluate the different possible explanations and determine which one makes sense of all the historical facts. [i] G. Habermas, M. Licona. (2004). The case for the resurrection of Jesus. [viii] G. Habermas, M. Licona. (2004). The case for the resurrection of Jesus. I read your three posts (G.O.D, and the two about Jesus) which enlighten me on the subject. But, as you have mentioned in your article G.O.D that Islam also talks about Jesus. So, it would be enlightening to know how Jesus is represented in Islam. I’m looking forward to hearing from you if you are going to write about it. Thank you n keep it up ! Thank you for those comments. I must admit my knowledge of Islam and Jesus is limited and very basic. However the crucial differences between Islam and Christianity are that (1) Jesus according to Islam was a prophet and not divine and that (2) Jesus was never crucified and that (3) Jesus never rose from the dead. What is your view of Jesus?